Join us for Historical Happenings in The Last Green Valley, 1 – 3 p.m., May 12, Roseland Cottage, 556 Route 169, Woodstock, Connecticut 06281. 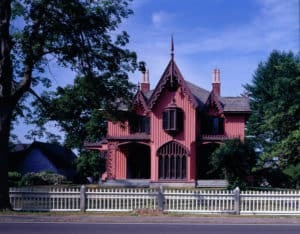 The Last Green Valley staff and the staff of Roseland Cottage will host a a tour of the museum followed by an informative program and workshop on Marketing for Small Museums and Historic organizations. After the tour, we’ll explore two staples of good marketing — writing effective press releases and using social media. Please be prepared to share your experiences writing press releases and bring samples, if you wish. We’ll also explore how to effectively use social media, such as Facebook and Instagram, for marketing your organization and programs. Please RSVP to Bill Reid by e-mail at bill@tlgv.org or calling 860-774-3300. Historical Happenings are sponsored by The Savings Institute.